Paul Henry Konerko (/kəˈnɛərkoʊ/; born March 5, 1976) is an American former professional baseball first baseman who played in Major League Baseball (MLB) for the Los Angeles Dodgers, Cincinnati Reds and, for most of his career, the Chicago White Sox. Konerko helped the White Sox win the 2005 World Series over the Houston Astros, the franchise's first since 1917. From 2006 to 2014 he served as the White Sox captain. Born in Providence, Rhode Island, Konerko is of Polish (paternal) and Italian (maternal) descent. At Chaparral High School in Scottsdale, Arizona, Konerko was named the Arizona Republic/Phoenix Gazette Player of the Year as a senior, after leading his team to a Class 4-A state championship. Konerko hit .558 in 1994, the school season record until Ike Davis, who later became the first baseman for the New York Mets, hit .559 in 2003. Konerko also held the school season record in doubles, with 18, until Davis hit 23 doubles in 2003. He also held the school career record in doubles (44), until Davis passed him with 48 doubles. Konerko was ranked the #1 catcher in the nation during his senior year in high school. Konerko was drafted in the first round (13th overall) of the 1994 MLB draft by the Los Angeles Dodgers. On May 13, 1995, with the San Bernardino Spirit, he drove in the only run of a 21-inning game. It was the longest shutout in California League history. Konerko played for the Triple-A Albuquerque Dukes. He is one of three Dodgers position players to have been twice selected for the Dodgers organization's "Minor League Player of the Year" award, along with Billy Ashley and Joc Pederson. He played parts of the 1997 and 1998 seasons with the Dodgers. In a little more than 150 at bats, he hit just 4 home runs. Konerko was traded, along with lefty pitcher Dennys Reyes, by the Dodgers to the Cincinnati Reds for All Star closer Jeff Shaw. Konerko played 26 games with the Reds. On November 11, 1998, Konerko was traded by the Reds to the White Sox for Mike Cameron. In 2000, with a 95–67 record, the White Sox made the playoffs for the first time since 1993. Konerko made his first postseason appearance that year, when the White Sox lost to the Seattle Mariners in the 2000 American League Division Series (ALDS). The Mariners swept the series in 3 games, and in 9 at-bats, Konerko had no hits. He got on base once on a walk. Konerko (right) and Jermaine Dye (left) present a jersey to then-President George W. Bush as the White Sox are honored at the White House for their victory in the 2005 World Series. In 2005, the White Sox defeated the Los Angeles Angels of Anaheim in the American League Championship Series (ALCS). After going 0 for 4 in the first game and 1 for 4 in the second game, Konerko hit 3 for 4 with three RBI's in the third game of the ALCS against the Angels. Two of the RBI's came from a home run in the first inning. In Game 4, Konerko was 1 for 4 with three RBI's on another first inning home run, the second in as many nights. In Game 5, Konerko went 1 for 5 with another RBI  He was named the ALCS MVP on the strength of a .268 batting average, two home runs and seven RBI's  He said, "I think you could split this four ways", referring to his feeling that the MVP should be awarded to the White Sox starting pitchers who pitched four consecutive complete games in the ALCS. In Game 2 of the 2005 World Series, Konerko hit the first grand slam in White Sox World Series history to put the White Sox ahead 6–4. It was also the first grand slam in postseason history to give a team the lead when trailing in the seventh inning or later. Those were Konerko's only RBI's of the World Series, but they were critical in giving the White Sox the momentum to complete a four-game sweep of the Houston Astros and they were the most for a White Sox hitter in the series. Konerko caught the final out for every one of the series-clinching games throughout the playoffs. Following the 2005 World Series victory, Konerko signed a five-year $60 million deal with the White Sox on November 30, 2005 after reportedly turning down more lucrative offers from the Los Angeles Angels and the Baltimore Orioles. Konerko became the face of the White Sox franchise after the departure of Frank Thomas who was the face of the franchise during the 1990s. Konerko concluded the 2006 season with 35 home runs, helping him rank in the top 10 for total home runs over the past three seasons, after hitting over 40 home runs in 2004 and 2005. In 2010, he was second in the American League for home runs with 39. On September 18, 2008, Konerko became the last opposing player to hit a home run at Yankee Stadium in the 9th inning of a 9–2 White Sox loss. 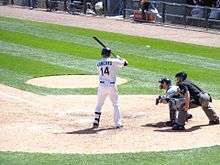 On Monday, April 13, 2009, Konerko connected back to back with Jermaine Dye for the 300th home run of both players' respective careers off of Detroit Tigers pitcher Zach Miner. This was the first time that this had ever happened in Major League history; where two players had hit a century milestone home run in one game, let alone back to back. On July 7, 2009, Konerko was 3 for 4 with three home runs including seven RBIs in a 10–6 win against the Cleveland Indians. It was the first time in his big league career that he hit three home runs in a game. He is also the only White Sox player to accomplish that at U.S. Cellular Field. Konerko finished the 2010 season with 39 home runs, his most since 2005 and the third-highest total of his career. Additionally, he was in fifth place in the year's MVP voting, the highest finish of his career to date. On December 8, 2010, Konerko re-signed with the Chicago White Sox for 3 years worth $37.5 million. On June 1, 2011, Konerko hit his 377th career home run in a game against the Boston Red Sox, passing former White Sox player Carlton Fisk on the White Sox all-time home run list. Konerko is now second on the club's home run list currently with 400 as a member of the White Sox, trailing only Frank Thomas' 448. On June 10, 2011, Konerko hit a home run in a game against the Oakland Athletics, setting the franchise record for consecutive games with an extra base hit at 9 games. On June 20, 2011, Konerko hit his 385th career home run in a game against the Chicago Cubs, passing former White Sox player Harold Baines on the all-time home run list. On June 21, 2011, Konerko continued his hot June when he homered in a game against the Chicago Cubs and his 5th straight game, becoming the 5th player in White Sox history to hit a home run in 5 consecutive games. The other 5 are Greg Luzinski, Ron Kittle, Frank Thomas (twice), Carlos Lee, and most recently A. J. Pierzynski in 2012. Konerko made it onto his fifth All-Star team after winning the Final Vote contest for the American League. On August 23, 2011, Konerko recorded his 2,000th hit in the top of the 8th inning to tie the game at 4 to 4 against the Angels. Konerko finished the season with 30 home runs, 105 RBIs, and a .300 batting average, the 5th time in his career that he finished with 30 home runs and 100+ RBIs. In October 2011, White Sox general manager Kenny Williams admitted that he briefly considered naming Konerko player-manager for Chicago after the departure of manager Ozzie Guillén. However, Williams never discussed the possibility with Konerko. Former White Sox player Robin Ventura was named manager for the upcoming 2012 season. There has not been a player-manager in Major League Baseball since Pete Rose served in the capacity for the Cincinnati Reds in 1986. In November 2011, Konerko was inducted into the Arizona Fall League Hall of Fame along with Phillies first baseman Ryan Howard. On April 25, 2012, Konerko hit his 400th career home run, passing Al Kaline and Andrés Galarraga and becoming the 48th player in Major League history to hit 400 home runs. Konerko was named the American League Player of the Week for the week of April 23–29. He hit .435 with 3 HR and 4 RBI. He led the AL in slugging and total bases that week. Konerko continued his hot hitting into the month of May as he racked up his second American League Player of the Week award of the season for the week of May 23–29. He hit .583 with 3 HR, 10 RBI, and a 14-game hitting streak, including his 400th career home run as a member of the White Sox, becoming only the second player in franchise history to hit 400 home runs, Frank Thomas being the first. On July 1, 2012, Konerko was elected by his peers, along with teammates Adam Dunn, Jake Peavy and Chris Sale to the 83rd All-Star Game in Kansas City. It was his sixth All-star appearance and his third in three years. Konerko's production declined in 2013, hitting .244 with 12 home runs and 54 RBI, his lowest number of both home runs and RBI since joining the White Sox. On December 4, 2013, Konerko re-signed with the White Sox to a one-year, $2.5 million contract. On April 23, 2014, Konerko doubled off of Detroit Tigers pitcher Justin Miller to break Frank Thomas' franchise total bases record with his 3,950th total base. Paul Konerko's number 14 was retired by the Chicago White Sox in 2015. Paul Konerko retired on September 28, 2014 after spending 18 years in the majors, the last 16 of which were with the White Sox. All but 81 of Konerko's 2,348 career MLB games were played with the White Sox. Konerko was the last member of the 2005 Champion White Sox left on the team at the time of his retirement. It was announced on Paul Konerko Day that his number (#14) will be retired and a statue of Konerko was revealed by the statue of fellow 2005 teammate Frank Thomas. On October 24, 2014, Konerko was named Co-Winner of the Roberto Clemente Award, sharing the honor with Jimmy Rollins of the Philadelphia Phillies. By winning the award, Konerko became the first member of the White Sox to do so. On May 23, 2015 prior to a game against the Minnesota Twins at U.S. Cellular Field, Konerko became the 10th White Sox player to have his number retired. In May 2016, the White Sox celebrated U.S. Cellular Field's 25th anniversary by introducing the 25 most memorable moments in the park's history. In a bracket style competition, Konerko's grand slam in Game 2 of the 2005 World Series was voted the best moment in the park's 25-year history, as it was deemed as an iconic moment in the breaking of the franchise's 88 year championship drought. Paul married Jennifer Wells in 2004. They have two sons and a daughter: Nicholas, Owen and Amelia. ↑ Brad Falduto, Tribune (May 15, 2005). "Chaparral rolls to third straight state title". East Valley Tribune. Retrieved May 13, 2010. ↑ "Reds Trade All-Star Shaw To L.A". CBS News. 1 2 "Paul Konerko Statistics and History". Baseball-Reference.com. Retrieved September 28, 2014. ↑ "Konerko re-signs with White Sox All-Star first baseman inks five-year deal to remain in Chicago". MLB. November 30, 2005. Retrieved October 23, 2008. ↑ Merkin, Scott (April 13, 2009). Nfext=.jsp&c_id=cws "Back-to-back, Dye, Konerko reach 300" Check |url= value (help). MLB. Retrieved August 2, 2009. ↑ Merkin, Scott (December 8, 2010). "Konerko, White Sox stay together with new deal". MLB.com. Retrieved December 8, 2010. ↑ "Paul Konerko of the Chicago White Sox named the American League Player of the Week". MLB.com. April 30, 2012. ↑ "Huge week nets Konerko AL weekly honor". MLB.com. May 29, 2012. ↑ "White Sox and Paul Konerko Agree to Terms on One-Year Contract". Retrieved September 28, 2014. ↑ "Semien's slam sparks White Sox comeback win". Chicago White Sox. Retrieved September 28, 2014. ↑ Bell, Kyle (September 29, 2014). "Paul Konerko Exemplifies the Best in Sports". South Bend Voice. Retrieved September 29, 2014. ↑ "Paul Konerko Stats, Video Highlights, Photos, Bio". Wikimedia Commons has media related to Paul Konerko.